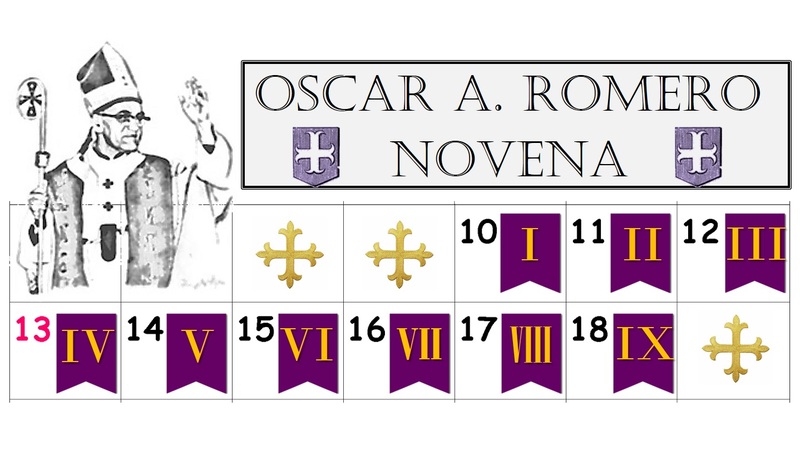 The Archdiocese of San Salvador asked all its priests to celebrate a novena of masses in honor of Blessed Oscar Romero starting on Thursday, March 10 and culminating on Friday, March 18, when the archdiocese will observe the martyr’s memorial this year. The actual memorial, March 24, coincides with Holy Thursday and had to be moved. For those who would like to follow the novena in prayer, here are the corresponding meditations from Día a Día con Monseñor Romero, which you can use for your reflections. Our Father, Hail Mary and Gloria. La Arquidiócesis de San Salvador pidió a todos sus sacerdotes celebrar una novena de misas en honor al Beato Óscar A. Romero a partir del jueves, 10 de marzo para culminar el viernes 18 de marzo, cuando la arquidiócesis observará el memorial del mártir este año. El memorial verdadero del 24 de marzo, coincide con el Jueves Santo y tuvo que ser trasladado. Para aquellos que deseen seguir la novena en oración, aquí están las meditaciones correspondientes de Día a Día con Monseñor Romero, que pueden utilizar para sus reflexiones. In his last seven Sunday homilies, Blessed Oscar Romero holds up Mercy as the quintessential message of Lent. “There is no sin that cannot be forgiven, no enmity that cannot be reconciled if there is conversion and a sincere return to the Lord,” Romero exhorts. (March 23, 1980 Homily.) “This is the voice of Lent!” Let us review the outstanding notes of this great homiletic cycle. As Pope Francis reminds us that reminds us of the words of the Lord, “I desire mercy and not sacrifice” (Mt 9,13), Archbishop Romero warns that fasting and penitential practices must lead us to perform works of mercy: “but more than these official, legal things, I invite you to live a Lent that is not so much about not eating too much meat, or something else, but in abstaining ourselves and sharing with those who have less what little we have. To live the experience of participation, of love, of charity. To make our Lent first of all a great exercise in reconciliation with our enemies. To learn to forgive, to prepare ourselves to rise with Christ in love in the next Passover.” (Feb. 17, 1980 Hom.). God’s mercy is revealed in the parable of the prodigal son. “Rather than preach when it comes to this parable, I would prefer that we sit quietly and remind ourselves that these pages of the son are our own individual story. Each of you, as well as I, can see in the parable of the prodigal son our own history, which always comes down to the project we were saying from the Old Testament: a loving God who has us in his house and a rash and capricious break by us to go seek the enjoyment of life without God—sin. And an awaiting God, waiting for the day when the son returns. And when the son finds himself in misery, and the abandonment of men, he remembers that there is no greater love than God’s. He comes back, and that God whom he expects to find resentful or turning his back, he finds turned toward him with open arms that are willing to celebrate the return”. (Mar. 16, 1980 Hom.). Blessed Romero is merciful to all, even to the rich. “I wish to make a call—a fraternal and pastoral one—to the oligarchy, to be converted and to live, and to assert its economic power in happiness of the people and not in disgrace and ruin of our population,” he exhorts. (Feb. 24, 1980 Hom.). Romero does not preach the destruction and downfall of the powerful class, but its conversion so it can have life in full—“to be converted and to live” and be a protagonist of “the happiness of the people.” Romero makes his call to reconciliation extensive to the various sectors of Salvadoran society with targeted appeals to each segment: the government, popular opposition groups, those in armed insurrection (Mar. 16, 1980 Hom. ), and finally, the army (Mar. 23, 1980 Hom.). In apocryphal words attributed to the martyr as he lay dying, there was one last preaching on the subject. “May God have mercy on the assassins!” This closes the circle: God does not desire sacrifice, but mercy. En sus últimas siete homilías dominicales, el Beato Mons. Óscar A. Romero nos presenta a la misericordia como el mensaje esencial de la Cuaresma. “No hay pecado que no quede perdonado, no hay enemistad que no se pueda reconciliar cuando haya una conversión y un retorno sincero al Señor”, exhorta Romero. (Homilía del 23 de marzo de 1980.) “¡Esa es la voz de la Cuaresma!” Repasemos las notas sobresalientes de esa grandiosa prédica. Tanto como el Papa Francisco, que nos recuerda de las palabras del Señor, “Misericordia quiero y no sacrificio” (Mt 9,13), Mons. Romero advierte que los ayunos y prácticas penitenciales nos deben conducir a las obras de la misericordia: “pero más que estas cosas oficiales, legales, yo les invito a que vivamos una Cuaresma en que no hagamos consistir en comer tanto carne, otra cosa, sino en mortificarnos y en compartir con los que tienen menos lo poco que nosotros tenemos. Vivir ese sentimiento de participación, de amor, de caridad. Hacer sobre todo en nuestra Cuaresma un gran ejercicio de reconciliación con los enemigos. Saber perdonar, saber prepararnos para resucitar en el amor con Cristo en la Pascua próxima.” (Hom. 17 feb. 1980). Nuestro modelo de misericordia es la actitud de Dios con nosotros, y Mons. Romero ofrece ejemplos concretos de esa ternura y mirada cariñosa. En primer lugar, está la encarnación de Dios en la historia, su participación activa, y su presencia. “Cristo es nuestro, Cristo es salvadoreño para los salvadoreños. Cristo ha resucitado aquí en El Salvador para nosotros, para buscar desde la fuerza del Espíritu nuestra propia idiosincracia, nuestra propia historia, nuestra propia libertad, nuestra propia dignidad de pueblo salvadoreño”. (Hom. 24 feb. 1980). La misericordia de Dios se revela en la parábola del hijo pródigo. “Más que predicar, cuando se trata de esta parábola, yo digo que preferiría que nos sentáramos en silencio y recordáramos que esas páginas del hijo son nuestra propia historia individual. Cada uno de ustedes, así como yo, podemos ver en la parábola del hijo pródigo nuestra propia historia, que se reduce siempre al proyecto que decíamos del Viejo Testamento, un cariño de Dios que nos tiene en su casa y una ruptura caprichosa y loca de nosotros por irnos a gozar la vida sin Dios, el pecado. Y una espera de Dios, esperando el día en que el hijo llegue; y cuando el hijo, tocado por la miseria, por el abandono de los hombres, se acuerda que no hay más amor que el de Dios, vuelve, y a ese Dios que debía de encontrar resentido o de espaldas lo encuentra volteando hacía él con los brazos extendidos dispuestos a hacer una fiesta por el retorno”. (Hom. 16 mar. 1980). El Beato Romero es misericordioso con todos, hasta con los ricos. “Quiero hacer un llamado fraternal, pastoral, a la oligarquía, para que se convierta y viva y haga valer su potencia económica en felicidad del pueblo y no en desgracia y ruina de nuestra población”, exhorta. (Hom. 24 feb. 1980). Romero no predica la destrucción y derriba de la clase poderosa, sino su conversión para que pueda obtener la vida en plentitud: “que se convierta y viva” y se vuelva protagonista de la “felicidad del pueblo”. Romero hace su llamado a la reconciliación extensivo a los varios sectores de la sociedad salvadoreña en interpelaciones dirigidas a cada segmento: al gobierno, a los grupos de oposición popular, y a los grupos de insurrección armada (Hom. 16 mar. 1980), y finalmente, al ejército (Hom. 23 mar. 1980). En palabras apócrifas atribuidas al mártir después de desplomarse agonizando se plasma una última predicación sobre el tema. “¡Que Dios tenga misericordia de los asesinos!” Así cierra el círculo: Dios no quiere sacrificios, sino misericordia. For the first time this year, the commemoration of the martyrdom of Blessed Oscar Romero will not be simply a popular remembrance but a liturgical memorial, following the slain Salvadoran archbishop’s beatification last year. March 24, the actual anniversary and the date fixed by the Church as the official memorial, falls on Holy Thursday this year, so the Salvadoran Church will observe it the Friday before, March 18, setting up the prospect of a double commemoration. There will be Romero-centered commemorations on alternative dates (March 18 in San Salvador) in deference to Easter, and Holy Thursday itself will be tinged with a Romero resonance for his followers because it is the anniversary of his 1980 assassination. On this blog, our theme will be “Following Jesus.” Here is the program which we hope helps others give focus and meaning to their own commemorations. · On Friday, March 18, our theme will be “Following Romero on the Way of the Cross.” This will be the Friday before Good Friday, nestled between two other important memorials: Saint Patrick on Thursday, March 17 and Saint Joseph on Saturday, the 19th. These feasts present an anticipation of the Triduum, in which we see the history of the church from the days of Christ and his contemporaries (St. Joseph), to the evangelization of Europe (St. Patrick), to the faith today (Bl. Romero)—“Following Jesus” through the ages. · On Holy Thursday, and throughout Easter, the focus will properly be on Jesus and how Romero enriches our appreciation and experience of the passion. Particularly, on March 24, we will reflect on “Romero’s Unfinished Eucharist,” and how the sacrament instituted by Jesus is ours to receive or reject in our lives. Romero’s canonization will be presented particularly in the light of completing Romero’s unfinished Eucharist to the extent that we use it to complete what remains of Christ’s sufferings (Colossians 1:24). · On Holy Thursday, March 24 through Easter Sunday, March 27, we will reflect on Romero’s “Unfinished Eucharist” and his vision of the Church (“The Church of Easter”). 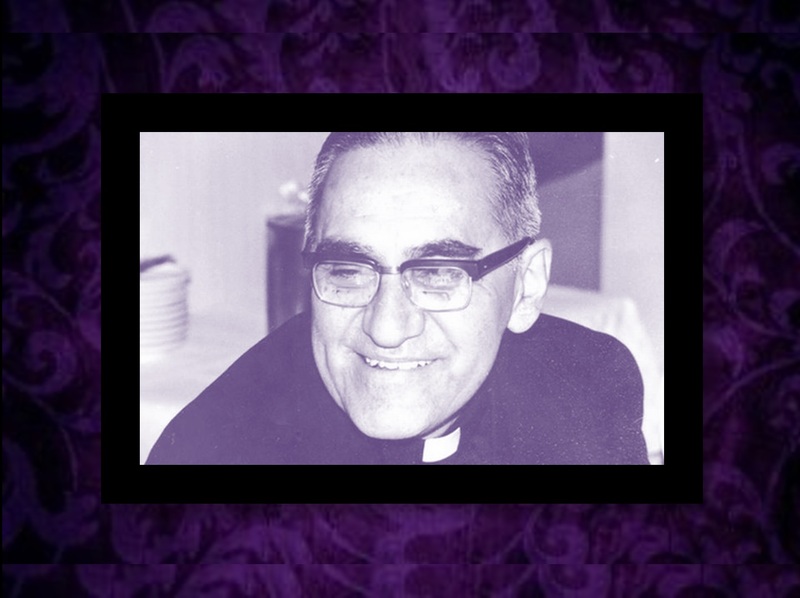 We hope that you will find these reflections helpful, and that you will join us this Lent in praying for the prompt Canonization of Blessed Oscar Romero, Bishop and Martyr. Por primera vez este año, la conmemoración del martirio del Beato Óscar A. Romero no será simplemente un recuerdo popular, sino también memoria litúrgica, a raíz de la beatificación del asesinado arzobispo salvadoreño el año pasado. El 24 de marzo, aniversario real y la fecha fijada por la Iglesia como el memorial oficial, cae el Jueves Santo este año, por lo que la Iglesia salvadoreña la observará el viernes anterior, 18 de marzo, creando la posibilidad de una doble conmemoración. Habrá conmemoraciones centradas en Romero en fechas alternativas (18 de marzo en San Salvador) en deferencia a la Pascua, y el propio Jueves Santo estará teñido de una resonancia Romero para sus seguidores porque es el aniversario de su asesinato en 1980. En este blog, nuestro tema será “Siguiendo a Cristo.” Este es el programa que esperamos ayude a otros a darle enfoque y sentido a sus propias conmemoraciones. · El viernes, 18 de marzo nuestro lema será “Siguiendo a Romero en el Camino de la Cruz”. Este será el viernes antes de Viernes Santo, situado entre otros dos memoriales importantes: San Patricio el jueves, 17 de marzo y San José el sábado, 19. Estas fiestas presentan una anticipación del Triduo, en la que vemos la historia de la iglesia desde los días de Cristo y sus contemporáneos (San José), a la evangelización de Europa (San Patricio), a la fe hoy (Bto. Romero)—“Siguiendo a Cristo” a través de las edades. · El Jueves Santo, y a lo largo de la Pascua, el enfoque estará adecuadamente sobre Jesús y el cómo Romero enriquece nuestro conocimiento y experiencia de su pasión. En particular, el 24 de marzo, vamos a reflexionar sobre la “Eucaristía Inconclusa” de Romero, y cómo el sacramento instituido por Jesús es nuestro para recibirlo o rechazarlo en nuestras vidas. La canonización de Romero se presentará como una forma de completar la Eucaristía incompleta de Romero en la medida en que la usemos para completar lo que queda de los padecimientos de Cristo (Colosenses 1,24). Nuestro lema “Siguiendo a Cristo” es también un pequeño tributo a Mons. Ricardo Urioste, Presidente fundador de la Fundación Romero, quien falleció a principios de este año, a quien le gustaba decir que él seguía a Romero porque Romero estaba “siguiendo a Dios”. · El Jueves Santo, 24 de marzo, hasta el domingo de Pascua, 27 de marzo, vamos a reflexionar sobre la “Eucaristía incompleta” de Romero y su visión de la Iglesia (“La Iglesia de la Pascua”). Esperamos que encuentren estas reflexiones útiles, y que se unan a nosotros en esta Cuaresma en la oración por la pronta Canonización del Beato Óscar A. Oscar Romero, Obispo y Mártir. Per la prima volta quest’anno, la commemorazione del martirio del Beato Oscar Romero non sarà semplicemente un ricordo popolare, ma una memoria liturgica, dopo la beatificazione dell’arcivescovo ucciso salvadoregno l’anno scorso. Il 24 marzo, l’attuale anniversario e la data fissata dalla Chiesa come il memoriale ufficiale, cade il Giovedi Santo di quest’anno, così la Chiesa salvadoregna osserverà il memoriale il Venerdì prima, 18 marzo, impostando la prospettiva di una doppia commemorazione. 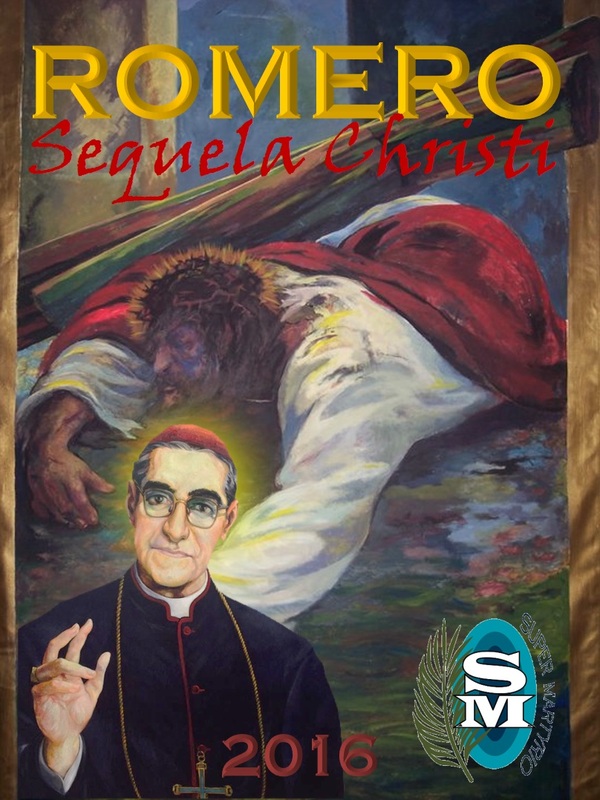 Ci saranno commemorazioni Romero in date alternative (18 marzo a San Salvador) in ossequio alla Pasqua, e Giovedi Santo si sarà tinto di una risonanza Romero per i suoi seguaci, perché è l’anniversario del suo assassinio in 1980. In questo blog, il nostro tema sarà “Seguendo Cristo”. Ecco il programma che speriamo che vi aiuterà a portare fuoco e significato alle proprie commemorazioni. · Venerdì 18 marzo il nostro motto sarà “Seguendo Romero sulla Via della Croce”. Questo sarà il Venerdì prima del Venerdì Santo, incastonato tra altre due importanti memoriali: San Patrizio il Giovedi 17 marzo, e San Giuseppe il Sabato 19. Queste feste rappresentano un’anticipazione del Triduo, in cui vediamo la storia della Chiesa dai tempi di Cristo e dei suoi contemporanei (San Giuseppe), all’evangelizzazione dell’Europa (San Patrizio), alla fede di oggi (Beato Romero)—“Seguendo Gesù” attraverso i secoli. · Il Giovedi Santo, e per tutta la Pasqua, il focus sarà correttamente su Gesù e come Romero arricchisce il nostro apprezzamento e esperienza della passione. In particolare, il 24 marzo, rifletteremo sulla “Eucaristia incompiuta” di Romero, e come il sacramento istituito da Gesù è nostro per ricevere o rifiutare nelle nostre vite. La canonizzazione di Romero sarà presentata in particolare alla luce di completare l’Eucaristia incompiuta di Romero nella misura in cui lo usiamo per completare ciò che resta delle sofferenze di Cristo (Colossesi 1,24). Il nostro motto “Seguiendo Cristo” è anche un piccolo omaggio a mons. Ricardo Urioste, il presidente fondatore della Fondazione Romero scomparso all’inizio di quest’anno, che amava dire che ha seguito Romero, perché Romero stava “seguendo Dio”. · Il Giovedi Santo, 24 marzo, fino alla Domenica di Pasqua, 27 marzo, rifletteremo su “l’Eucaristia Incompiuta” di Romero e la sua visione della Chiesa ( “La Chiesa della Pasqua”). Speriamo che troverete queste riflessioni utili, e che vi unirete a noi questa Quaresima nella preghiera per la pronta Canonizzazione del Beato Oscar Romero, Vescovo e Martire.